4.3.2.5: Calendar Service (iCal) . On the Task Bar you can see whether the WLAN interface of your Mac is active and connected to a WLAN network or not. When you click on the WLAN symbol (see image on the right) you will see all available WLAN networks which are in reach. The small lock behind some networks indicates that the network uses encryption and needs authentication. This menu also gives you the option to activate/deactivate the WLAN interface (AirPort). More information about this issue you can find on the corresponding network web sites WLAN at DESY or WLAN instruction to learn how to configure WLAN on your Mac. In the System Preferences of the Network Interfaces you can find a list of all available communication interfaces as well as corresponding details. Using this menu you can activate, deactivate and configure the interfaces. 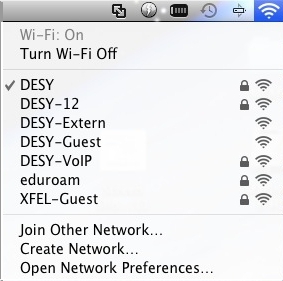 The screenshot which you can see on the right shows the standard configuration of the ethernet interface for the DESY internal and the guest network. 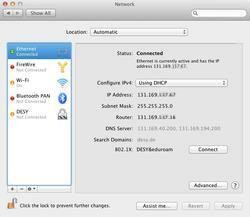 Various information for the guest network and for the internal network will be acquired by the Mac automatically once the configuration is set to DHCP. More general information about Ethernet at DESY you can find on https://it.desy.de/services/networks/lan/index_eng.html. For registering your device for the DESY Intranet please refer to your segment administrator. If you do not know the name of the responsible person please call the User Consulting Office (uco@desy.de; ext. 5005). Note: It is necessary that the VPN resource is enabled for your DESY account in the Registry. If you don't have this resource or if you are not sure please ask one of your Registry administrators or the UCO (uco@desy.de, ext. : 5005). Since MacOS 10.6 (Snow Leopard) the operating system brings a CISCO VPN client with it. The client is fully integrated to the system and can be configured via the network preferences of the system. So you don't need any additional software. All you have to do is to click on the Network/WLAN symbol on the task menu and open the network preferences. There you click on the "+" button (see figure 1) to add a network connection. In the next window (figure 2) chose "VPN" as interface and "Cisco IPSec" as VPN Type. If you want to you may also change the Service Name to e.g. "DESY VPN". When you are done press the create button. After that you come back to the main menu of the network preferences (figure 1). 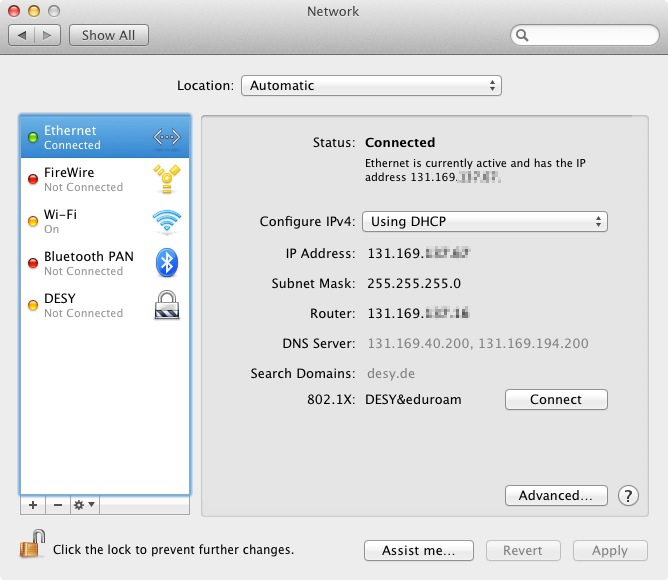 There you must configure the VPN gateway (vpn.desy.de) and type in your user name (your general DESY account name). The last thing you have to do is to configure the VPN group name. To do this please click on the button Authentication Settings and you will get the window which is shown in figure 3. The group name is desy. If you don't know the password which belongs to the group name please ask one of your group administrators or the UCO. If you are also done with this please click OK, click on the connect button (figure 1) and enter your login data when the VPN client asks for them to establish the VPN connection. If you should not be able to connect via VPN anymore from one day to another and your password is still valid it is possible that your device need a reboot.